Donna Weeks, an expert on the Australia-Japan relationship, considers the implications of Abe’s recent trip to Australia. Japanese Prime Minister Shinzo Abe’s recent visit to Australia was welcomed by Australian Prime Minister Tony Abbott as signifying the two countries’ “special relationship,” a sentiment shared by his conservative counterpart. Yet amid attacks from China over Abbott’s allegedly “offensive” remarks on Japan’s wartime past, as well as warnings from domestic critics over Australia’s perceived favoritism toward Japan, the regional implications of the two countries’ closer economic and defense ties are still being assessed. The Diplomat spoke to Donna Weeks, Japan security expert at the University of the Sunshine Coast, about the historic significance of the first official visit by a Japanese leader to Australia since 2002, as well as the importance of the newly signed Japan-Australia Economic Partnership Agreement (JAEPA) and defense equipment agreement between the two U.S. allies. What was the significance of Abe’s visit and the fact it was the first address by a Japanese leader to Australia’s Parliament? It was an important one – he was due to come out in 2007 before domestic issues overcame him and he ended up resigning, so it was an overdue trip for him. He’s made a lot of the importance of his grandfather Nobusuke Kishi in the Australia-Japan relationship, so I suspect at some level it was an important trip personally. I was impressed he gave his speech in English and I think he and his speechwriters did quite well, with even an Aussie twang to his ‘today.’ Overall it was quite thoughtful and creative; the reference to the NSW rescue services chief [for his work after the 2011 tsunami disaster] was quite a nice way to make a connection, as was the Dawn Fraser reference and the reference to [former Prime Minister] Julia Gillard. Whoever wrote the speech covered all the bases. Abe started his speech by making a “solemn vow” renouncing war. What was the significance of this, particularly in the context of his recent move concerning Japan’s right to collective self-defense? I think any Japanese prime minister is going to be caught between the form and substance…for a lot of people, as we’ve seen with China and others, no amount of apology [by Japan] over the war will ever suffice. For others, there is going to be the question as to why raise it. Japan is never going to be allowed to leave it behind, certainly not in my lifetime. Abe was at pains to say that the reinterpretation of the constitution isn’t going to lead to further militarism…he and his predecessors have been at pains to say that Japan is not going to go back. There’s been a stronger reaction to Abbott’s comments about the [Japanese World War II] submariners in Sydney harbor. The China Daily has described Abbott as “shortsighted” for backing Abe and his defense changes, saying Canberra’s support would “compromise” Australia’s ties with other Asian countries. Do you agree? Countries are always going to have this argy-bargy, and it strikes me that it’s kind of like the Cold War again. I’m old enough to remember the great ideological battles and it’s not unlike that, it just stays in that sense of threat, but I don’t think any of the countries are ultimately going to act on it. In the same way that the Soviet Union and the U.S. kept saying to each other, we can blow you off the face of the earth, there was always this sense that they wouldn’t do it. Instead of just raw threats, if we start thinking about it like a possible Cold War, there will always be these threats. A concept I’m currently working on, the security community, argues that all the members can operate within the community without the fear of there being a war – they can have dependable expectations of change, we are going to have our skirmishes and differences, but ultimately cooperation will overrule any conflict in the end. It’s a bit warm when you look at the territorial disputes – there’s not the threat of nuclear devastation that the Soviet Union and the U.S. had, but I get a sense that it’s more about a rhetorical stance. Behind what we see here, I know there’s a lot of economic cooperation that gets overlooked. We focus on this war potential at the expense of other things. Does Australia’s support for Japan threaten ties with China, in a type of zero-sum game? Beijing can say what it likes, but ultimately it relies heavily on our iron ore. It’s exactly where Japan was three decades ago, and the reliance that China has on us will generally outweigh any threat of retaliation. If any country can demonstrate that you don’t have to pick a side, Australia is in a position that you don’t have to pick sides. It doesn’t have to be a zero-sum game. Give me good reasons why we can’t all work together? 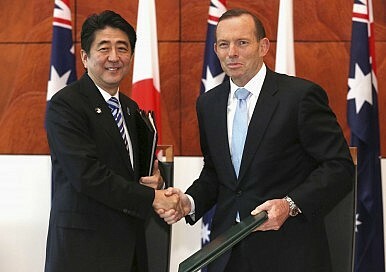 Just how special is Australia’s “special relationship” with Japan – is this an overused term? They started the special relationship in the 60s, we had a honeymoon period after 57, then we had the special relationship, then we had a constructive partnership that [former Foreign Minister] Gareth Evans put in ‘89, then we had the north and south anchors, then we just went right off the radar…I think you can have several special relationships and they’re all special for different reasons – when you start using comparatives you get into trouble. How do you see the significance of the economic partnership agreement, in terms of the broader relationship? Clearly there’s two quite distinct camps – those who are set to benefit from the liberalization are happy with it, but then you’ve got others who are saying it’s going to take 15 years for the tariff cuts and anything can happen. They sound good in theory but is a free trade agreement (FTA) ever really free trade? There’s always going to be the underlying issue of food security, which is why Japan has been tough in opening up its agriculture. There’s increasing nationalistic tendencies that are starting to emerge…there’s been Sydney papers pushing the line that all the wealthy Chinese are buying up our property. There’s always good and bad in FTAs. I can’t see you need a FTA when all those things can be done through negotiation anyway – it’s more a rhetorical flourish on what could be done otherwise, without the potential problems. Free trade has also been a long-term aim of APEC, but it’s a tricky one. What are your thoughts on Australia’s defense equipment agreement with Japan? What about the potential for Australia to be dragged into a future regional conflict? Right back around the time of the first Gulf War, Australia has been supportive of the incremental move Japan has been making toward a stronger military position. Australia when it could have tapped Japan on the shoulder and said as a special friend, do you really think you should be going this way, we have never done so. At each increment, people haven’t looked back at it in its historical perspective. Gareth Evans with the constructive partnership was supportive of Japan when it got into trouble at the end of the first Gulf War with its ‘checkbook diplomacy’. When we signed that security agreement [with Japan] a few years ago, I was a bit surprised that we’re locked into any conflicts really…and now we’ve gone even further. I’m disappointed in the way the collective defense argument has gone in Japan – I think Abe would have been in a stronger position with the rest of the region if he’d taken it to a referendum. Given the events of the past week, how do you see the future of Australia-Japan ties? I think they’re going to keep going along fairly solidly – we’ve got a really good basis. This has been a longstanding relationship: Australia was quite significant in Japan’s modernization going back to the 19th century. We are one of the solid relationships in the region. Some of those things they were talking about in their speeches about common, liberal democracies they’ve been talking about for many years, and there is an element of truth about them. Those really deep person-to-person exchanges we have, it’s always put to the bottom of the pile but I think it’s really important. Abe referring to Dawn Fraser the way he did, and recognizing how Australia assisted with the tsunami, these are really important aspects that do privilege our similarities over our differences. There wasn’t that level of interaction when we went to war…We can cope with the differences better than we could in the past. Australia's submarine decision has significant implications for its strategic relationship with Japan.